American Avocet dancing in a partially drained pond near the Duck Creek Trail Head at the Clark County Wetlands Park in Las Vegas, Nevada. On my way into a local nature preserve, I was tickled by the comments of a couple of elementary school aged kids directed to their grandparents. A Double-crested Cormorant catching lunch downstream of the Las Vegas Wash bridge. As an educator, a nature lover and an East Las Vegas resident, moments like this make me proud to live in a community that has created such a wonderful place out of what was once a wasteland. When I walk in the wetlands I am surprised by a different treat every time I visit. Last Wednesday I had an extended encounter with a Belted Kingfisher that was flitting back and forth along the Monson Channel. A Belted Kingfisher waits for unsuspecting fish to pass by below. On another visit, one of the ponds northeast of the Duck Creek Trail head was partially drained making it ideal for viewing all sorts of interesting shore birds such as American Avocet, Black-necked Stilts, Sand Pipers. I have seen Great Horned Owls, beaver, coyote, all kinds of ducks, raptors and other wildlife. I enjoy walking quietly by myself or with my wife, observing nature quietly. Others come to the park and participate in organized classes and activities geared toward learning more about what the park and its nature have to offer. By contrast, sixteen years ago, when I first visited the area that is now the Clark County Wetlands Park, all I saw where old discarded tires, piles of trash, abandoned cars and shanty towns amid miles and miles of tamarisk trees. The powers that be be saw what was happening to the area, the wildlife including endangered species, and the water that was running through the area back into Lake Mead. They decided to clean up the area and restore and develop it into a series of mitigation ponds and natural habitats that would help clean up the waste water from Las Vegas as it heads back down Las Vegas Wash into the source of drinking water that is Lake Mead. Now, if you walk through the park, you feel as though you are in a completely natural area with all of nature's creatures living out their lives in the natural way. There is evidence of the daily struggle between prey and predator. If you want to see what the Wetlands Park used to look like, all you have to do is look at the area next to the road between Sam Boyd Stadium and the Duck Creek Trail Head. This area is not part of a nature preserve and it is not maintained or cleaned up, so it is a good example what happens to nature as a result of unbridled human impact. Sunrise looking down Las Vegas Wash as a Blue Heron looks for breakfast. The governmental agencies that have partnered over the past two decades to create and maintain this great resource, have done a commendable job. I look forward to seeing the park in another five or ten years after all the recently planted trees along the wiers mature. White Owl Canyon is a delightful surprise. It is not only a beautiful slot canyon but it is a treat for wildlife viewing for the careful explorer. White Owl Canyon is so easy to get to and yet it seems so remote when you are in this owl infested slot canyon. It’s March and the temperatures are in the 70s in and around Las Vegas. It’s the perfect time to hike in the desert. The cacti are starting to bloom and wildlife is coming out to do what wildlife do in springtime. White Owl Canyon is a great place to see owls if you go there early in the morning with just a few people who can be very quiet. You are likely to see owls in the rocks near the top of the slot canyon. You are also likely to see other wildlife such as big horn sheep, coyotes, hawks, eagles, ravens and snakes. Since it is springtime take extra care not top disturb nests or nesting activity. To get to White Owl Canyon you need to find 33 Hole Vista Point between the Henderson entrance to Lake Mead NRA and the Boulder City entrance to Lake Mead NRA along Lakeshore Road. Once you turn into the vista point area, look for the first picnic ramada on the left and park. The trail descends steeply into the lake bed from this first ramada. Follow the trail along the lake shore for approximately ½ mile to the NW where a wash comes into the lake. Follow the wash to the left, away from the lake, and it will turn into a slot canyon a few hundred yards upstream. This slot canyon is where you find owls in the rocks up high. You can find many owl pellets on the floor of the canyon where owls have regurgitated indigestible animal parts. If you look closely at the pellets, you will see small animal bones and skulls. As you get further up the canyon, it opens back up to a wider canyon and you walk through two different culverts, one that runs underneath Lakeshore Road and the next one that runs underneath the bike trail. Bring a flashlight for safety and be careful where you step so you don’t accidentally step on a snake. This is a beautiful, photogenic and fairly easy hike, with the exception of the first 50 yards down the hill from the picnic ramada. Wear good shoes and as usual, bring plenty of water. 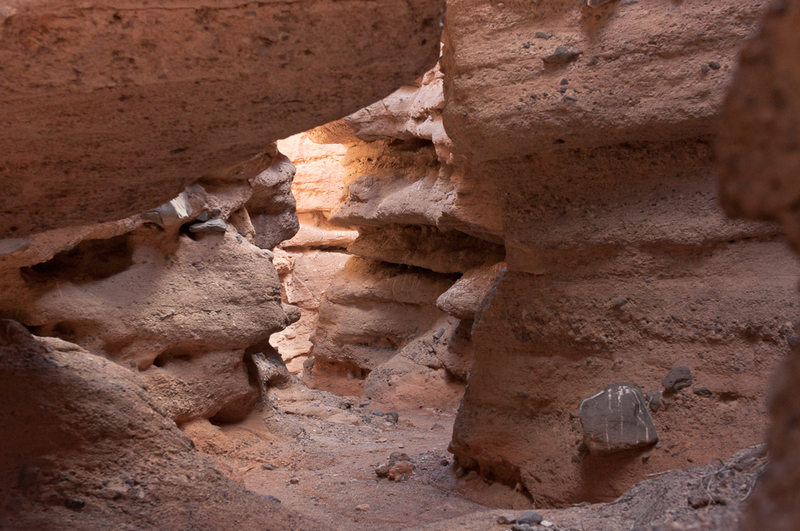 As with any wash or slot canyon, stay out when there is the treat of heavy rain to avoid being caught in a flash flood. Birdandhike.com gives a pretty good description on how to get to the canyon at http://www.birdandhike.com/Hike/LAME/WhiteOwl/_WtOwl.htm . They mention barn owls in this website. When I was there, I saw a great horned owl as shown in the photo below. 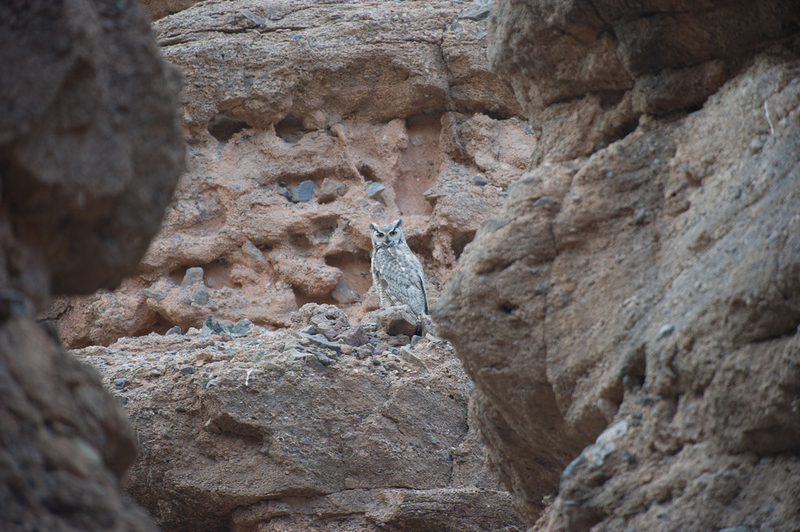 This owl flew down the slot canyon only a few feet above my head as I was walking up the canyon.